Is the Monarch Butterfly the New Bald Eagle? Or is it the new passenger pigeon? In an earlier posting I asked if neonicotinoids are the new DDT. Just minutes ago I received a press release announcing the filing of a petition calling for protection of the Monarch Butterfly under the Endangered Species Act. 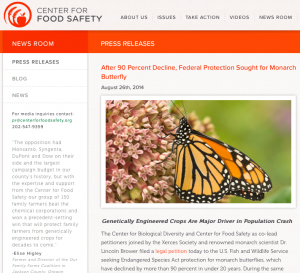 The petition is being brought by The Center For Food Safety, The Center For Biological Diversity, The Xerces Society, and Lincoln Brower, one of the world’s preeminent Monarch researchers who has studied these butterflies since 1954. The petition comes in response to a 90 percent decline in Monarch populations since 1995. This same crash has been occuring with honey bees and the only thing that has prevented a similar decline is the presence of beekeepers and managed colonies. The bees are on life support and beekeepers are that life support. We are on the verge of losing the beekeepers however, because it is beginning to appear that most of the U.S. environment has been so massively poisoned that even their best efforts may be to no avail, their bees are going out into an environment that is hostile to life. This may be one of the greatest environmental issues of our time. I encourage you to read the entire petition. It addresses pesticides from page 89 to page 98. I also encourage you to scroll back and read some of the earlier posts. You might find the animated maps of neonicotinoid use particularly interesting. Remember when you watch the explosive growth of these chemicals that they are 5 to 10 thousand times more toxic than DDT to lower life forms. It is little wonder that we are seeing the catastrophy we are. The wonder is that it is still being defended and nothing is being done.